Daigo “The Beast” Umehara is a legendary Street Fighter player, but even legends need to eat, which is why the pro dropped everything in the middle of a match to find a can of Red Bull. Red Bull is one of his sponsors. And since those in the fighting game community don’t get rich off of prize pools or salaries like players in other esports, keeping sponsors happy is important. 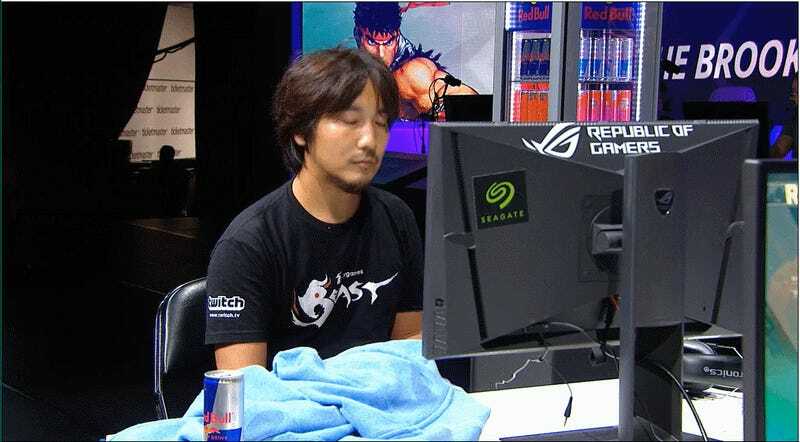 That’s why Daigo jumped out of his chair during a losers quarterfinal set of Brooklyn Beatdown against Bryant “Smug” Huggin to grab a can from the case behind him so its logo could be displayed for the duration of the bout. Smug gave his Japanese rival an extended side-eye before going on to edge him out 3-2. No amount of Red Bull cans could protect the Beast from a clinical beating at the hands of Balrog. You can re-watch the rest of the tournament here.